MANCHESTER: Jurgen Klopp admitted Liverpool have to learn to cope with the pressure of being embroiled in a tense title race after their frustrating 0-0 draw at Manchester United. 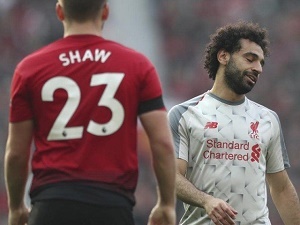 Klopp’s side squandered the chance to go three points clear at the top of the table in a dour stalemate against their bitter rivals. The Reds hold a one-point lead over second-placed Manchester City, but have now used up the game in hand they held over Pep Guardiola’s team. In a match of few chances at Old Trafford, United lost three players in the opening 42 minutes, the first time a Premier League team has been forced into three first-half substitutions in four years. But Liverpool were unable to capitalise, especially after Roberto Firmino was forced off through injury after half an hour, a loss which clearly impacted the usually effective Mohamed Salah and Sadio Mane. “Of course there is pressure but, from my point of view, it’s very positive,” Klopp said. “It’s pressure but I don’t have to play, I just have to sit here and say dumb things, that’s easy! “The boys have to learn in these situations and the only way we can do it is with passion. “The heart and soul of this club is passion. Watford on Wednesday night is another chance, then there is a derby (at Everton) which is always an emotional game, passionate. United manager Ole Gunnar Solskjaer will also have concerns over his team’s midweek game — Wednesday’s visit to Crystal Palace — after Anthony Martial and Nemanja Matic failed pre-match fitness tests. As the first half wore on, Ander Herrera, Juan Mata and substitute Jesse Lingard were all also forced out with hamstring injuries, while Marcus Rashford played most of the game with a painful ankle injury after being fouled early by Jordan Henderson. “I think you can’t say ‘targeted’ but you can say there were quite a few fouls on him, definitely,” said Solskjaer when asked if Liverpool had set out to rattle Rashford. “And normally I would take him off after five minutes, because whoever it was went straight through him. “His ankle blew up straight away but he wanted to run it off. “Then I couldn’t take him off with Juan and Jesse going off, so we’re hoping he’s not done too much damage. Saluting his side’s battling display, which preserved Solskjaer’s unbeaten record in the league since taking over as interim boss, the Norwegian said: “We were playing with 10 and half but the atmosphere made up for it, and Rashy’s attitude made up for it as well. “I think they dominated the possession, had a lot of the ball but we had the biggest chances. Lingard’s injury had come while he was in the process of missing the game’s best chance, being denied by Alisson’s smothering save after being played clean through by Romelu Lukaku just before the break. In a second half of equally few chances, United created the best with Joel Matip’s late own goal being ruled out for offside and Chris Smalling narrowly failing to connect with Lukaku’s injury-time cross that would almost certainly have led to a goal.